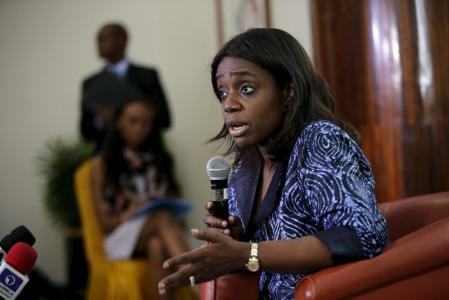 Nigeria’s Minister of Finance, Kemi Adeosun, at the ongoing Spring Meetings of the IMF/World Bank in the United States of America on Friday explained why the Federal Government is not excited about calls to apply for loan facility from the International Monetary Fund to tackle some of the current economic challenges that the country is facing due to the slump in global oil prices. Furusawa, and Rwanda;s Finance Minister Claver Gatete. Adeosun, who was a speaker at a panel discussion on Africa, titled: “Sub-Saharan Africa: Just a Rough Patch,” said Nigeria is adapting to its new realities and it is implementing fiscal policies to steer the country back on track for stable growth with a diversified economy. These policies and investment should enable Nigeria to show positive growth in 2017. Adeosun emphasised that what the country is passing through is surmountable, adding that government is already applying a cocktail of measures to address the problem. “Nigeria is not sick and even if we are, we have our own local remedy,” the Minister said, in an apparent response to a question on why the government has refused to apply for IMF loans. Noting that the real vulnerability in the Nigerian economy is over-dependence on a single source of revenue, oil, the Minister said: “We have resolved to build resilience into the country’s economy to hedge against future oil shocks. This is because dependence on oil brings about vulnerability and laziness. So we are doing a combination of things to diversify our economy, with revenue mobilisation to enable sufficient investment in developing the non-oil sectors. “We have a great opportunities to reset the Nigerian economy and ensure that as we go forward, growth will be in a sustainable manner so that we won’t be vulnerable to oil price fluctuations, and with a truly diversified economy we would have enabled opportunities for wealth creation that would have trickles down to every Nigerian.